FILE - Defense Secretary Jim Mattis talks to U.S. troops at Guantanamo Bay, Cuba, Dec. 21, 2017. Outgoing U.S. Defense Secretary Jim Mattis is giving some final advice to troops and the Defense Department's civilian employees – maintain your faith in America and continue to stand by the country's allies. "Our Department's leadership, civilian and military, remains in the best possible hands," Mattis wrote in his official farewell message Monday, his last day on the job. "I am confident that each of you remains undistracted from our sworn mission to support and defend the Constitution while protecting our way of life," he continued. "So keep the faith in our country and hold fast, alongside our allies, aligned against our foes." Monday's letter comes as Mattis prepares to relinquish his office to Deputy Secretary Pat Shanahan, who will become acting defense secretary as of January 1. 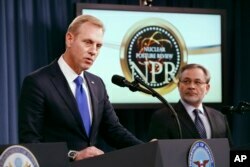 FILE - Deputy Defense Secretary Pat Shanahan is pictured at the Pentagon, Feb. 2, 2018. Unlike Mattis, who came to the Pentagon as a revered former Marine general who served in Afghanistan, Shanahan does not have any military experience. Shanahan came to the Defense Department from aviation giant Boeing, where he spent more than 30 years overseeing both civilian and military related programs. Shanahan was named deputy secretary in 2017. Mattis resigned on December 20 following a White House meeting with Trump during which the two men disagreed over the president's decision to withdraw all U.S. troops from Syria, where they have been helping in the fight against the Islamic State terror group. "You have the right to have a Secretary of Defense whose views are better aligned with yours on these and other subjects," Mattis wrote to Trump at the time, adding he would stay on until the end of February 2019 to allow time for a successor to be found and so that he could represent the U.S. at a NATO Defense Ministerial meeting. Mattis also warned the president that the U.S. "must be resolute and unambiguous in our approach to countries whose strategic interests are increasingly in tension with ours," naming both China and Russia. "Our strength as a nation is inextricably linked to the strength of our unique and comprehensive system of alliances and partnership." According to Pentagon officials, Mattis' departure, at his own request, will not be marked by any of the fanfare normally seen to pay respect to an outgoing defense secretary. Instead, the handover of authority from Mattis to acting Defense Secretary Shanahan will marked by a phone call, alerting all relevant government agencies to the change in command. Shortly after the Pentagon released Mattis' farewell message Monday, the Trump took to Twitter. "I am the only person in America who could say that, "I'm bringing our great troops back home, with victory," and get BAD press," he wrote. Mattis began his last message as secretary of defense by quoting from a telegram U.S. President Abraham Lincoln sent to Gen. Ulysses Grant in 1865, just over two months before the end of the U.S. Civil War. "Let nothing which is transpiring, change, hinder or delay your military movements, or plans," it read.